Cosmic Consciousness: Buddhist prototype in hindu temples. Buddhist prototype in hindu temples. Unbelievable but true, whats stand today as hindu architecture, namely dravida(south) and nagara(north) styles, has taken its influence from Buddhist art. Infact the buddist chaitya seems to have been the prototype for many other religions as well. Not proven historically, but starkly visible is the close resemblance of the buddhist chaitya hal with today's cathedral. The nave and central aisles are common to both and this feature has not been taken up half as much by our hindu counterparts. What brought about this kind of architecture in hindu temples? It seems very important that both buddhist and hindu shrines face eastward towards the rising sun and must be circum-ambulated. 1. 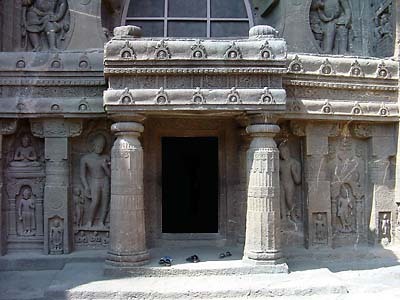 Path of circum-ambulation - Hence the path of circum-ambulation seems to have been brought into every chaitya, cave or temple. 2. The arched window - The other very important thing is that the main source of light(and in some cases the only source) was initially from the big arch window above the main door of the facade. 4. Buddhist retreats - Cells in which monks retreated during the monsoon had arched windows above them (replicating earlier wooden counterparts) and this whole element was later adapted into brahminical architecture on temple walls. 5. The tree of life - Finally, the ancient aryan/buddhist icon of indra symbolising water cosmology (depicted by a symbol of a pot base with a shaft hoisting up a capital over an abacus - called the tree of life) which was initially the theme behind the pillars on which ashoka wrote out his edicts, was the basis of original pillar architecture and later diluted itself to the walls of indian temples interspaced with sculptural niches. These were all strictly buddhist originally and have found their way into temple architecture. We cannot forget that the evolution of architecture started in wood, moved to rocky cliff walls where caves were carved into live rock. From there it moved into monolithic temple and cave architecture and finally dared to enter into the structural temple zone, a period which saw a lot of evolution in indian architecture, specially in the birth of orissa school. It has been a long journey through the centuries for indian architecture to shape up this way. Influences have come in from belief and traditional thinking. Funds came in from the ruling patronage to promote architecture buddist or hindu. All this coupled with the ritualistic backdrop of indian lifestyle. Today all we can do is preserve it, for rebuilding it is close to impossible. Photos courtesy: Original photos©2002 Michael D. Gunther. Kavitha - what is the meaning of chaitya? chaitya is the name given to a buddhist prayer hall. Normally these prayer halls have an apsidal floor plan with the door at one end and the stupa at the other end. Buddhist monks used to retreat to the hills during the monsoons and live in viharas(residence) and worship Buddha in prayer halls called chaityas. you can click on the link "path of circum-ambulation" to see what the inside of the chaitya looks like. Viharas and chaityas were carved into live rock next to each other along cliff sides.